Then why not decorate your house on your own. Here is one of the simple idea which can be done on your own and impress your dear ones. Table skirting is just as the name implies—a skirt for a table. 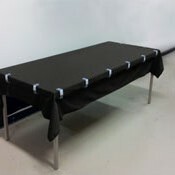 Table skirts consist of two components: the cloth table topper and a skirt that fastens to the table edge with clips, Velcro or snaps. Learn about the different kinds of table skirting and make your upcoming event a stylish affair. Gathered or shirred table skirts are a popular choice due to the simplicity and reasonable cost. A gathered or shirred table skirt is a fabric drape drawn together by threads along the top hem providing extra body to the skirt. A tighter gather gives a table skirt a full, ruffled appearance. 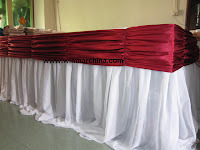 Knife pleats are one of the most common kinds of pleating for table skirt. A knife pleat is a series of narrow, sharp creases folded in the same direction. Unlike gathered table skirts, knife pleats create smooth, precise lines down the length of the skirt. 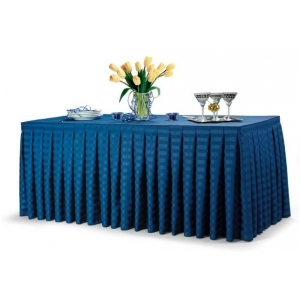 The knife pleated table skirt is a classic choice that is the least expensive of the pleated variety. 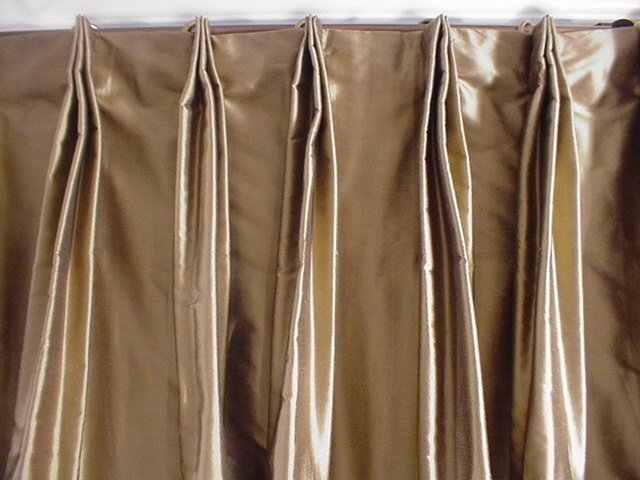 A box pleat table skirt is made from a sequence of back-to-back knife pleats. 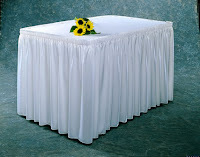 Box pleated table skirting is a good choice for a professional conference or business meeting. The box pleats give the table a neat, tailored appearance. 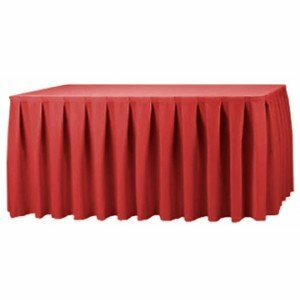 Box pleats have a more pronounced projection than a simple knife pleat, adding dimension and interest to business or formal tables. Table skirting with French box pleats provide even more volume than standard box pleats. French pleats are narrower than regular box pleats, giving the bottom of the table skirting a fuller appearance. French box pleats work equally well in casual or elegant settings. When budget and easy cleanup are a priority, consider plastic table skirting. 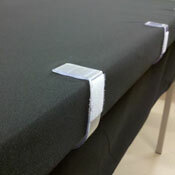 Vinyl fabric can be fashioned into simple gathers or knife pleats. 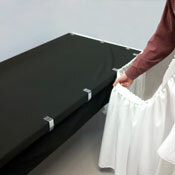 Vinyl table skirting is a cost-effective way to dress tables for any occasion. 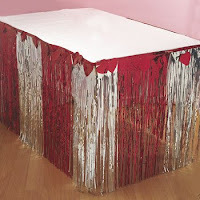 Fringe table skirting is a playful addition to party tables. Metallic, tissue and raffia fringe skirts have a number of imaginative uses. This kind of decorative fringe is a charming substitute for table skirting and serves as a festive wall border for special celebrations. Natural raffia table skirting is perfect for a tropical or luau-themed event. Raffia fringe works as hula table skirting, tiki bar draping and funky wall decor. 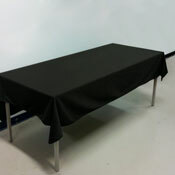 Banquet, business or party tables can be fitted with detachable swags that are placed over any kind of cloth table skirting. 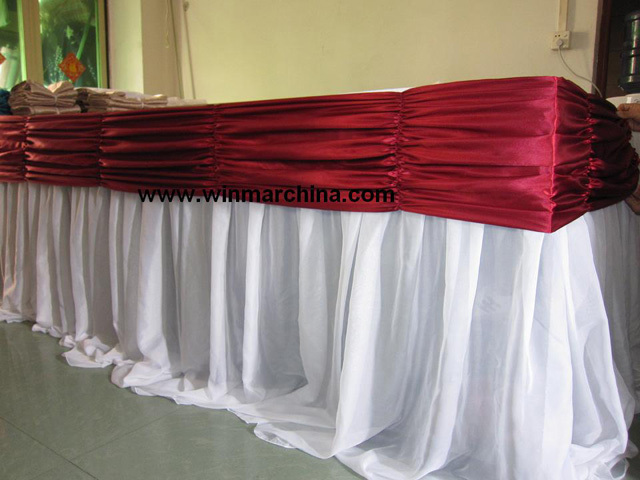 Swags are commonly attached with overlap clips that will not flatten or damage the table skirt pleating. Swags are an easy way to dress up an otherwise plain table skirt. The skirts are applied last. Skirts come in 3 different sizes - below you'll learn how to determine which size you need. Table skirting can of course be used without toppers or clips, but without clips you'll need a different means to attach the skirting to your tables. Clips slide over the topper and table edge - or bare table edge should you not want toppers. They come in many sizes to fit different size table thicknesses, and have clip on the outward portion. 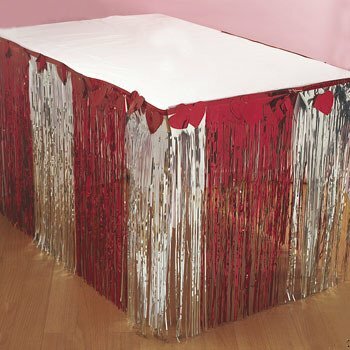 The topper is essentially a table cloth that covers the top of the table and a small amount of its sides. Starting with a empty table, place your Table Topper over the table. Place your Clips over the table edge and topper (usually one clip per foot). Pick a starting point and attach your Skirt to the first clip. Slowly work your way around the table and attach the Skirting to the remaining clip. Step 1 - Determine the Table Skirt Size you'll need. This is actually easy - skirts come in 3 standard size lengths: 13.5ft, 17.5ft, and 21.5ft (all are ~29" height). Most people skirt 3 sides of a table - some skirt all 4 sides. 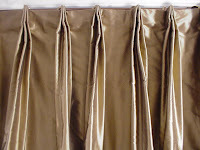 Step 2 - Choose a Color, Pleat type, and Material.